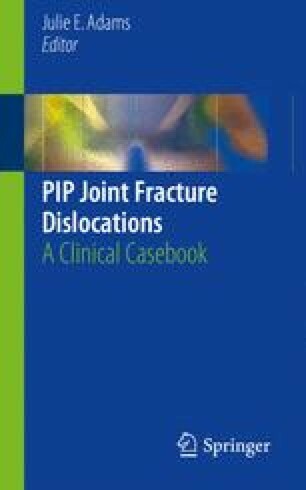 Open reduction and internal fixation is an option for treatment of PIP fracture-dislocations. The technique typically involves an open volar approach with placement of one or two 1.1–1.5 mm screws. This allows for restoration of the volar lip of the middle phalanx, which is the bony buttress to dorsal subluxation. The goal of fixation is to achieve a congruent joint and sufficient stability to allow for immediate active range of motion. Be very careful to avoid additional comminution of the bone. You get one good chance to place the screw. Take your time! Countersinking the screws can help to minimize the chance of the screws breaking through the cortex. If the volar plate is left intact, it is difficult to evaluate the joint reduction. If the piece is not comminuted, joint alignment can be approximated by aligning the distal cortical edges of the fracture.